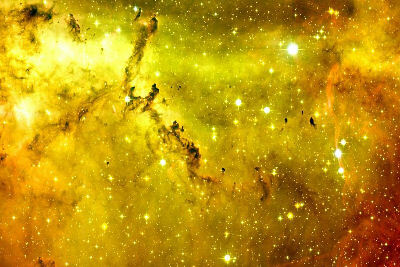 Diffused Nebulae (Omega Nebula) are illuminated nebulae that are extended, containing no well-defined boundaries. 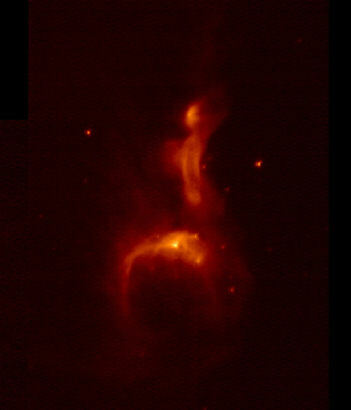 These nebulae are usually classified into Emission and Reflection types. 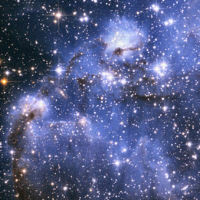 Emission Nebulae (NGC 2174) are internally illuminated clouds of ionized gas. Two of the most common types of emission nebula are H II regions and Planetary nebulae. Planetary Nebulae (Mz3) are compact shells of gas around a dead star or an intermittantly active star. Supernova Remnants (Supernova) are the results of the massive and cataclysmic detonation of a star. The resulting blast causes the remnants of the star to move away from it's original location at high speed, the debris thereby heated by colliding with (relatively) slow moving galactic dust and gas. Dark or Absorption Nebulae (LDN 1622) are unilluminated. They can be detected when they obscure stars or other nebulae. 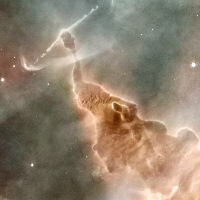 Famous examples include the Horsehead nebula in Orion, and the Coalsack Nebula in the Southern Cross. Protoplanetary Nebulae (Gomez's Hamburger) are an astronomical object which is at the short-lived episode during a star's rapid stellar evolution between the late asymptotic giant branch (LAGB) phase and the subsequent planetary nebula (PN) phase. However, this name is also in flux, see below. Nebula NGC 3582 within the star forming region known as RCW 57 APOD and HKsL (Blue=H, Green=Ks, Red=L) composite colour image of RCW 57 created using 2MASS and SPIREX images. From the survey report L-band (3.5 μm) IR-excess in massive star formation in .pdf format. 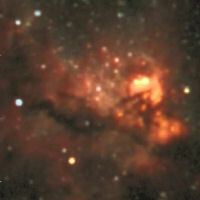 Star Forming Region in the Rosette Nebula and a close up of the lower region (southern in image) of the same image. This is from Canada-France-Hawaii Telescope / 2003. 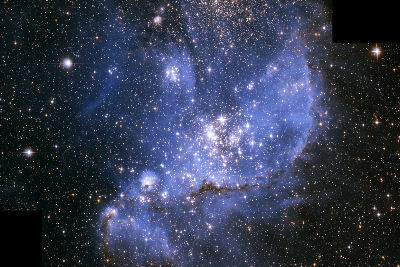 Star-forming region in nebula NGC 346 and close up. This beautiful image is from the European Space Agency website. 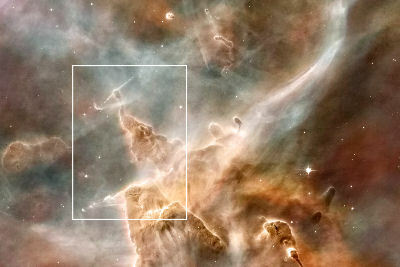 "Hubble's visible-light view of the nebula is on the left...Hubble's infrared camera reveals a chaotic, active star birth region [as seen in the right-hand picture]. Here, stars and glowing interstellar dust, heated by and scattering the intense starlight, appear yellow-orange." Circumstellar Regions and Ionized Nebulae from the Department of Physics and Astronomy: Annual Review 2002 Astronomy and Astrophysics. 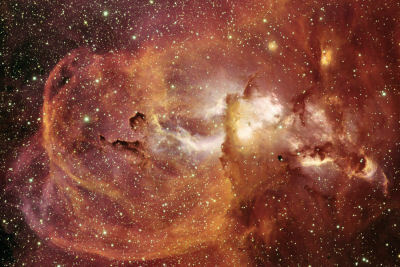 Star Formation "Intergalactic space is filled with clouds of gas (mostly H + He) and dust known as molecular clouds. These clouds are supported against gravitational collapse by their thermal pressure, but if the clouds get too big massive, gravity wins and they can start to collapse. 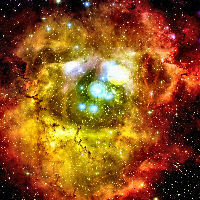 This is the first step towards star formation." from Case Western Reserve University Department of Astronomy. Subjects include Angular Momentum and it's effects on stellar birth. PLANETARY NEBULAE AND THE FUTURE OF THE SOLAR SYSTEM A montage of Planetary Nebulae observed with the Hubble Space Telescope. Hubble panoramic view of Orion Nebula From the European Space Agency image archives. Visit the ESA for more great images and information. Since this is an evolving website (a scientific way of say "always under construction") many of the pages on this site are continually being added to or updated. I do so as time permits and in a rotational fashion. As such, I'll be continuing this section after adding to those next in line. So please check back in two weeks or so.